During a lo altitude (about 150 m) survey flight out of Nova Lisboa (now Huambo) the DC-3 was being fired at. 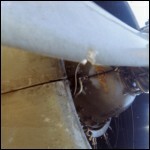 Hydraulic lines were damaged and fuel leaking rapidly from the starboard fuel tanks. A safe emergency landing was carried out at Nova Lisboa Airport's runway 11. One of the pilots was injured in the occurrence.